And some will probably best be implemented by a Government agency or department. Once the RN plan is finalised it needs to be managed. 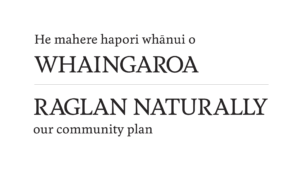 The plan requires the building and maintenance of relationships with a range of stakeholders including local community groups, the Raglan Community Board and the Waikato District Council. Who should manage the plan? There are a range of options for this. We have outlined what we consider to be the three most likely options and seek feedback from the community on these. Option 1 – Managed by a company or Trust specifically set up to undertake the RN management. A company, incorporated society or trust is established to manage the RN plan. The issues with this option is ‘who’ establishes the entity and what a accountability do they have to the community and other stakeholders? Who will resource the Company or Trust. Does it need a part-time employee to manage the plan? Who will pay for this? The plan, its inherent relationships and implementation is managed by the Community Board. The advantage of this is that the Community Board have been democratically elected and therefore have a mandate from the Community. The plan could potentially be managed by a sub-committee of the RCB. The issue with this option is whether the Community Board would have the time available to manage the plan. Option 3 – The Community Board establishes Company or Trust to manage the plan. This has the attributes of option 1 but by being established by the Community Board provides a level of democratic accountability back to the community. The Community Board may be best to decide what the right type of entity is required and whether it needs someone to be employed to manage the plan.